Stop your baby or toddler from getting to places that aren?t safe. Our Q-Fix Extra Tall Safety Gate is 110cm tall and constructed from durable steel and is pressure fitted to ensure that your little one will remains safe and sound at all times. With a simple squeeze and pullback handle and wide walk through design, this gate is a convenient and practical choice for any parent or home! Whilst the Gate is excellent Quality…it fails to keep my Puggle Alfie IN!! He is an Escape Artist Extraordinaire! The gate is very good and a good price.I am very please dealing with you Thankyou. I wil be buying from you in the near future. My grand daughter and 2 dogs could easily scale a conventional size gate, so we were looking for an extra tall gate that would keep them safe and give us piece of mind.This gate is perfect. It is easy to fit with the pressure mounted pads so no drilling is required. The gate is 2 way opening and can easily be opened with one hand. It is of a good quality and lovely finish.There is also a locking feature. I would highly recommend this gate and wish I had purchased ages ago. So if you have a toddler or dogs that think they are kangaroos then this is perfect for you. Arrived the day after I ordered it and not over packaged. Took me a bit of time to set up the closer, but once I had done that the gate works fine. It seems very secure (it has to keep cats out of a sewing room so I needed a tall one) and I like that it opens both ways, although you can set it to open only one way. It clicks very neatly to, as well. Overall, I am very pleased with it and hope it lasts as well as is promised. Excellent quality and super quick delivery. 3 days early. 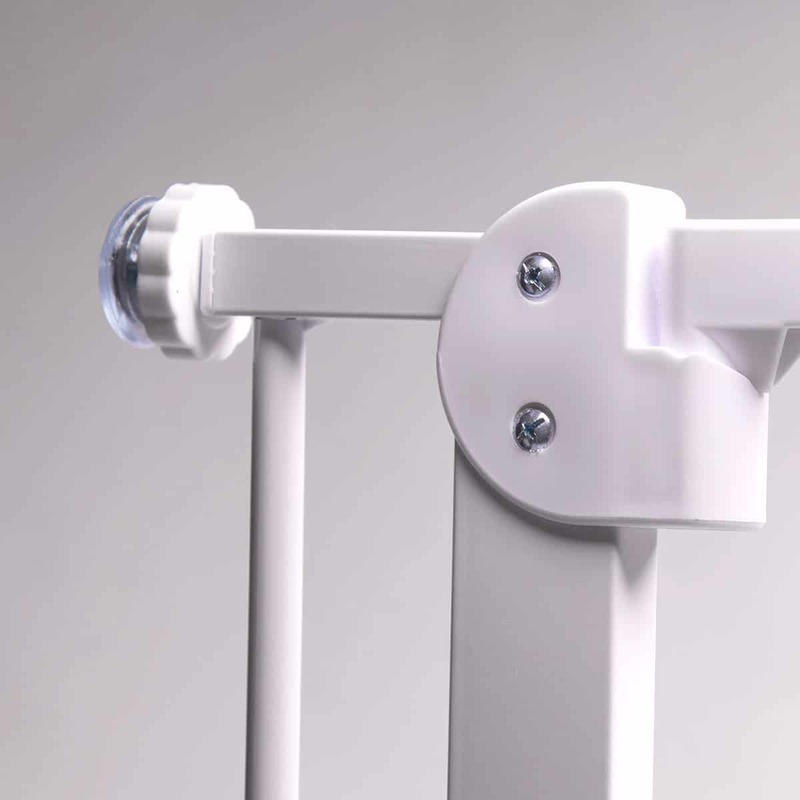 Great product, easy to install and open with one hand, very sturdy!! .. Brilliant gate just wish it didn’t only fit one door in the whole house as it’s very wide and my doors are fairly small :(!! This is a fantastically made product that does the job perfectly and more! It is very easy to fit, as I managed to do it myself wth just the instructions, and not having to go online for more help! The main difference between this and standard stairgates is the extra height, which was a godsend, as it meant my 4 year old who is of average height could not open it! This gave me great peace of mind knowing he could not get upstairs! I estimate this will last one more year before he manages to reach and figure out how to open it, by which time he should be older and more mature anyway! 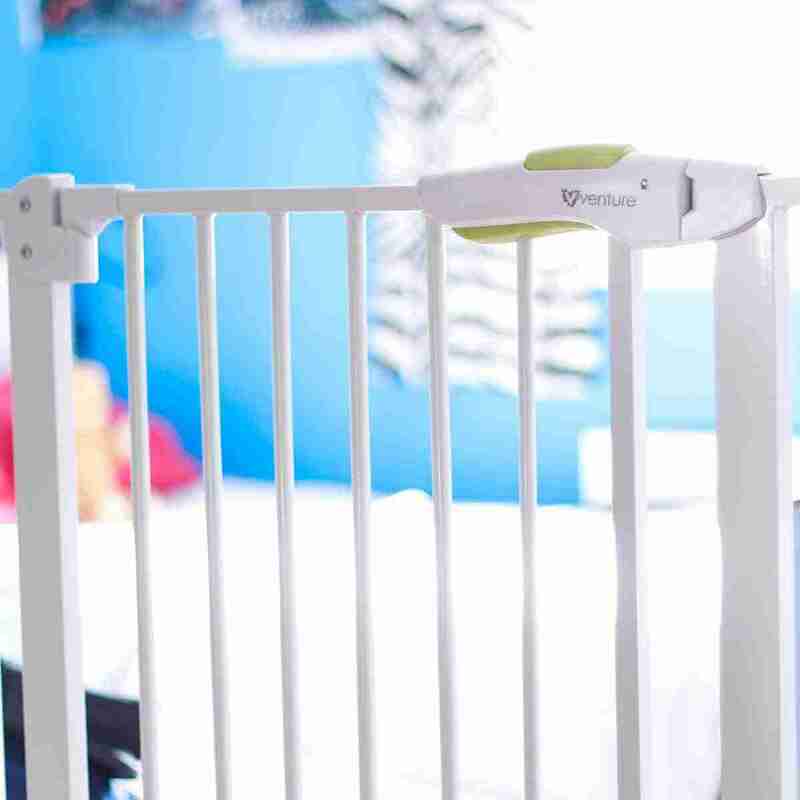 I would definitely recommend this stairgate to anyone with young children, as it is a brilliantly made product and is well worth the peace of mind it brings! This is amazing!!! It stops my little spiderman climbing up it and its too tall for him to be able to reach up and loosen it by unscrewing it! Worth the money ajd arrived early too! Purchased this item a week ago arrived quickly a couple of days, really pleased with item, great size width slightly bigger than usual, extra height great stops my staff putting paws on top of gate,very sturdy, looked everywhere for gate like this items similar were a lot pricier. Fantastic gate would recommend to anyone. Used to keep a giant lurcher out of the kitchen. A good quality, sturdy gate with easy to open catch. It stays open so I can carry things through without it bumping me on the arm and it closes on its own with a gentle push. A great height to keep our flat coat where we want him. Simple to operate and fitted well, also looks sturdy. 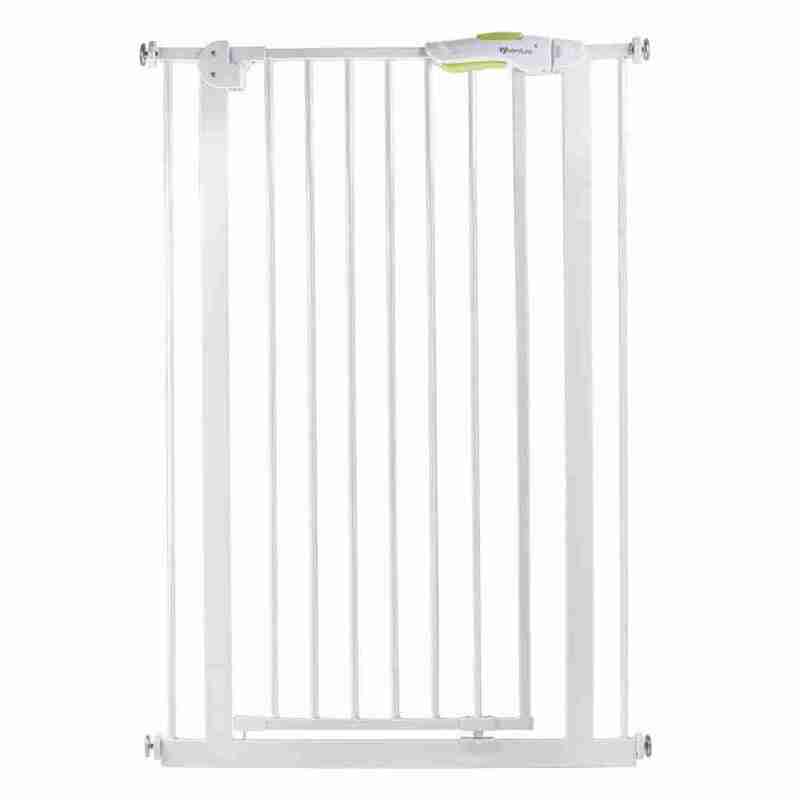 Rapid delivery, fair price, well made tall baby gate, defeated our jack Russell! Well made gate put in to replace one the dogs had broken. With a pull back opening mechanism it should be impossible for the dogs to open the gate when jumping up at it. Loses 1 star as the location cups do not have a sticky bit to locate them on the door frame easily. No problems. 1st class delivery time. Bought this for my puppy as she is a big breed and it?s brilliant . A lot bigger then the last one I had . Dog can’t jump this one! Only problem we have is that the door can’t close because of the height of the door handle causes an obstruction. Otherwise it’s a very good height. This is a really good gate for when my son comes to visit with his 2 labs! It enables me to put it across the opening between the kitchen and the utility room so they don’t eat anything they find in the kitchen. Normal safety gates were just not wide enough. Easy to open and very easy to set up. Fantastic product, does the job perfectly. Easy to fit, sturdy and perfect height to keep my two Newfoundland dogs contained. Good quality pet gate. I would recommend this product. really easy to fit. excellent product in general. We need a gate for our pets and this was the tallest one, it does the job perfectly. This is a very good stairgate. We needed the extra height as the “puppies” were able to leap the standard size version. An excellent gate that does what it says – particularly like the self closing element. 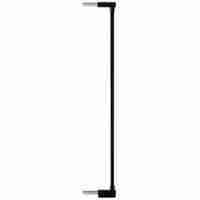 Very easy to install/erect with it up and running within 5 minutes of opening the box. Just the job to stop a hurdling Spanish water dog! Quality Gate @ realistic price. No problems fitting this, and our dog hasn’t yet worked out how to open this one! I am very pleased with this item,it is exactly what I needed the right height, sturdy and easy to use. Extremely good gate…sturdy and perfect for the job of keeping hounds where they are needed. Thank you! Nice gate, easy to open one handed and very, very easy to install but I had to cut one of the bars out because my cat couldn?t get through it as it?s extremely narrow between bars. the dog doesn?t realise how big she is and she?s constantly trying to play with him but she can get too rough so I needed something to separate my room from the rest of the house for him so he has a place to be quiet, so it does the job! 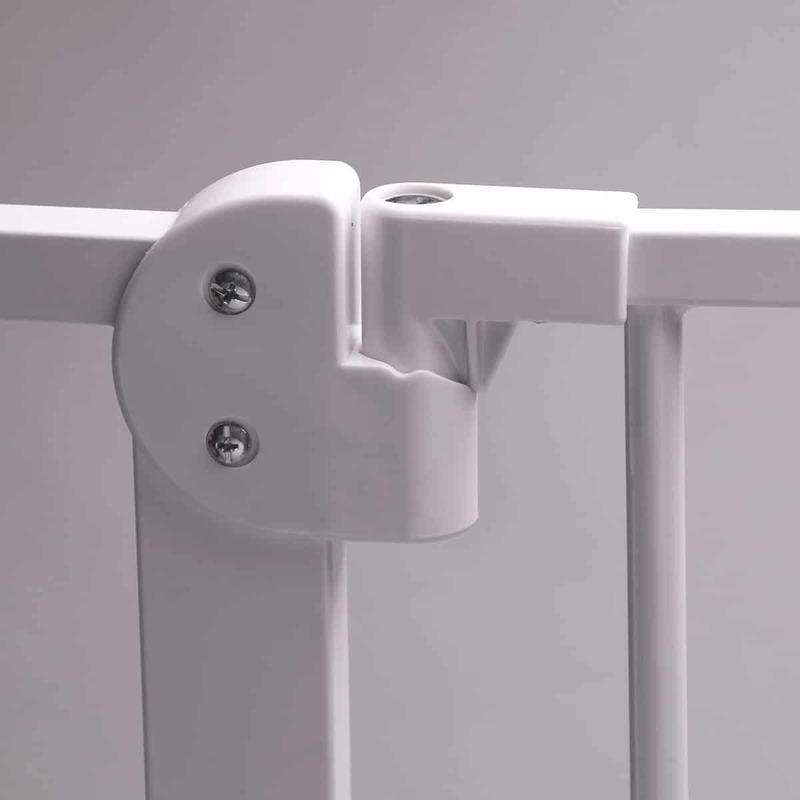 Excellent product and does the trick in stopping our little climber from getting over this one! Highly recommend!! Very stable and good quality. Easy to asemble. I am very very happy with this gate. It ticks all the boxes and keeps grandchild downstairs along with large and exuberant puppy so elderly collie can retreat upstairs when needed. The best quality gate I?ve found and much easier to open than most of the other brands..
Good quality, easy to fit and does the job I want it to do! Gate is fine but I really needed it slightly wider – do they do an extension as I can’t seem to find? 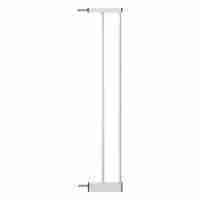 Excellent tall doggie gate for kitchen door, hallway or stair gate – where ever needed. No need to bend if you have a bad back and tall enough to stop most dogs jumping over. The only down side is the long screws easily fall out when moving the item around. Excellent buy. 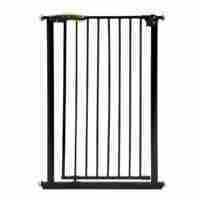 I have a Newfoundland who could escape over a normal size gate , this one is so easy to fit and is the perfect height. I just have to remember that I can no longer climb over the gate like the old one . Perfect for keeping my medium sized dog safely where I need her. Perfect height. Very easy to fit, extremely sturdy once in place. One handed mechanism to open is essential. Very good value for money. I highly recommend this product. Excellent as a temporary barrier for my medium sized dog. Fits well, and is practical, he can’t push it over. Large enough to keep cats separated but the bars are slightly further apart than the lower gate we have, bars are 6cm apart on this and 5cm on the smaller one; never the less a good buy as i put a piece of clear perspex on the bottom half to keep the smaller cat away from the super stud. BRILLIANT gate; high enough to keep my cat out of the lounge when he needs to be; SO simple and quick to put up; strong enough to withsta.nd a 1 year old boy’s ‘antics’! Delivered next day; excellent piece of ‘kit’. Turned up really quickly, and does exactly what it needs to. a great product, it does the job very well! I loved this gate. Closed so smoothly and was easy to install! Had it up in minutes… Unfortunately we returned as we realised we didn’t need such a tall gate. Seller refunded promptly and we now have a new (not as good though) normal baby gate. 5* love this product… Will buy again if we got a bigger dog!!! Had a traditional child?s stair gate to keep our mini doodle in utility when we out but could easily jump it, had not escaped from this higher one ? Brilliant product. Nice and high to stop the little darlings jumping it and only took two minutes to put in place. 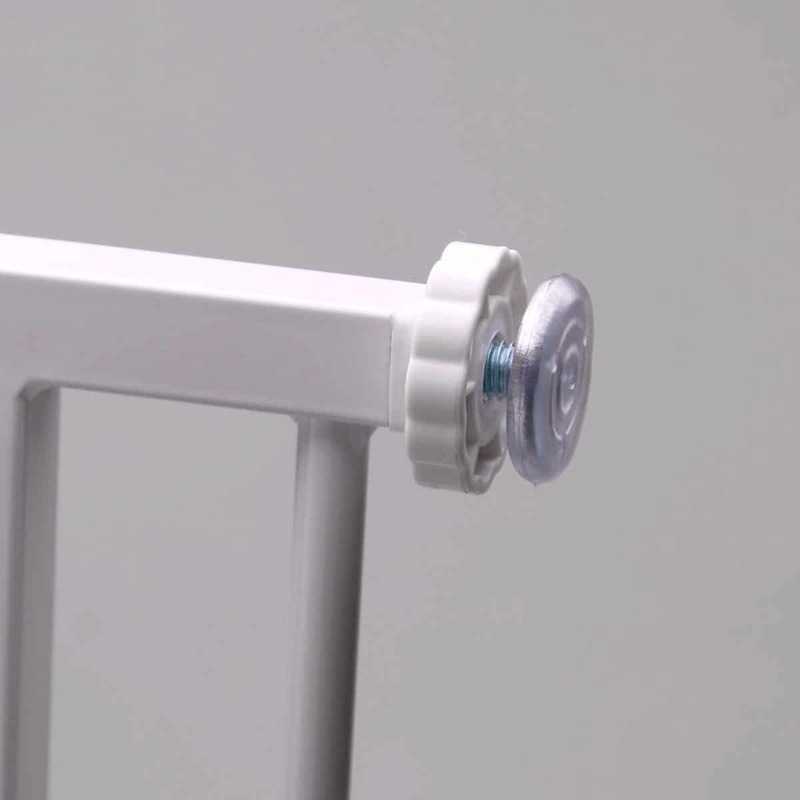 Really really good product – easy to fit and great that it works one handed in such an un-complicated way! Great for stopping my dog jumping over it into the kitchen! Shipping was great and it arrived the day it quoted. I have 3 cats, 2 of them young and athletic and an old lady who can’t jump. The old lady also likes to do her business on the carpet and with the lack of doors – with us not having the intention of installing doors, this was the perfect solution. However, she is an escape artist and made fools of us by simply sliding through the gaps between the bars. Fear not, my partner and I, not to be outdone by a feline, surrounded the bars with thick pipe foam – B&Q have a reasonably priced selection and the height is just perfect – no need for cutting. Bottom line – humans 1 vs cat 0. And it looks good too, and it’s very easy to install and operate. We love it. Wonderful gate, good looking, tall and keeps cats downstairs. Easy and quick to erect. No screws needed. I love it…and I loved its price, too. Never mind the pets! This was bought to stop my 4 he old granddaughter from climbing over. We had a standard one and then little monkey had no problems climbing over and coming downstairs at bedtime. Great gate nice and tall very easy to fit , love the self closing . Delivered quicker than expected, easy to fit and use. Good quality. Standard safety gates do a great job at keeping most children out of places they shouldn’t be, however all children are different and some just manage to find ways around them. 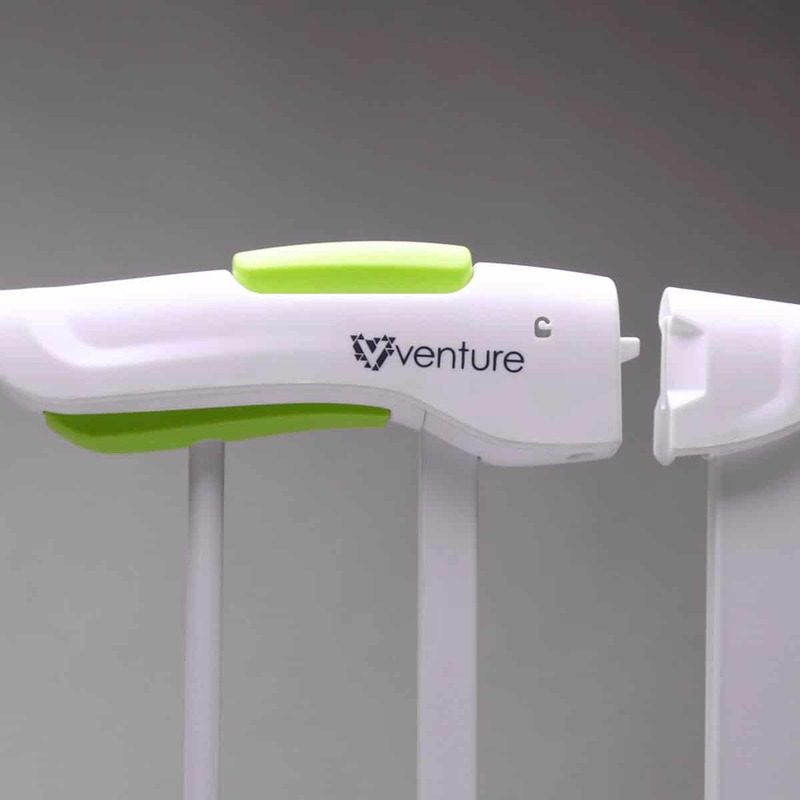 The Venture Q-fix Extra Tall safety gate is 110cm tall making it much tall than most average gates. This extra size height makes it even harder for little ones to get to places they shouldn’t be! No more damage to walls or door frames! 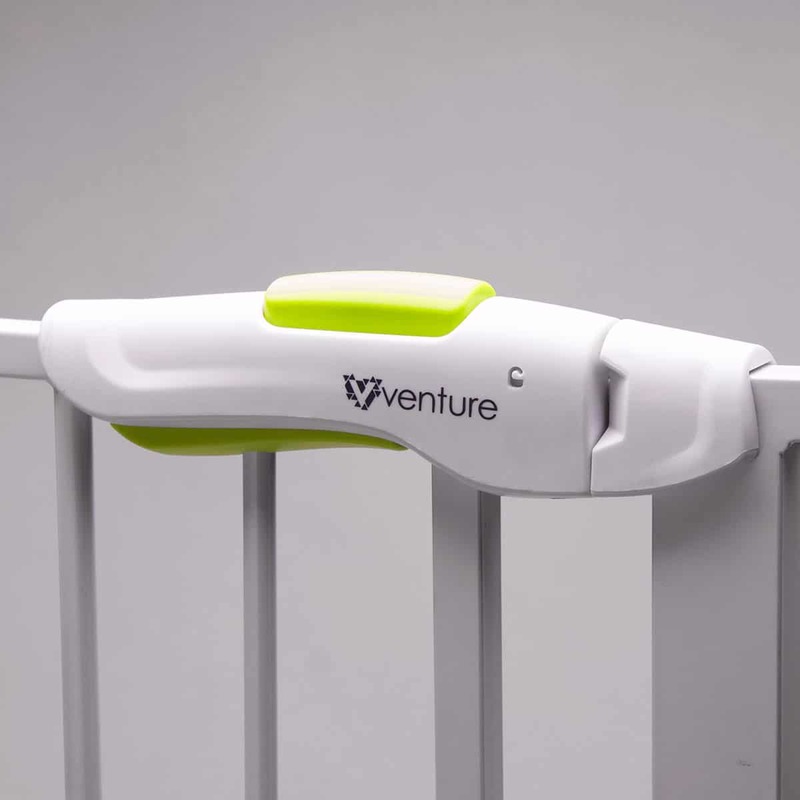 Venture Q-fix gates are designed to prevent damage to walls and door frames that are often associated with fitting many child safety gates. Holes and broken walls become a thing of the past with the Q-fix’s pressure fitting screws, simply slide the bolts into the hole and tighten the white cups, this generates pressure between the walls or frames and the gate itself holding it in place. Not only are our extra tall safety gates perfect for keeping children out of trouble, they’re also great for pets too. The extra height makes them perfect for keeping large dogs at bay without the need lock them away, so you can always keep an eye on them. The gaps within the bars are also narrow enough to prevent most pets from squeezing through.